32 Oz. 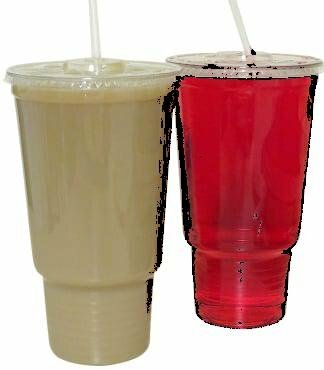 Cafeteria Size Extra Heave Duty Ultra Clear Plastic Cups with Lids for Iced Coffee Bubble Boba Tea Smoothie -Designed With Grip For Car Cup Holder -100 Sets Cup & Flat Lid + 1 reusable Cup set The on-the-go solution for your extra thirsty customers are looking for. This cup is made from a tough, clear plastic that will stand up to the task of holding all 32 oz. of a cold beverage. This cup will pleasantly display its contents as well. For those of your customers who are commuting, features a tapered bottom section to conveniently fit most car cup holders. 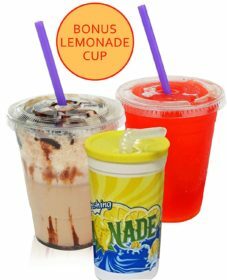 Being able to carry around a whole day’s worth of a favorite beverage has never been this easy for your customers with this great cup design! on-the-go solution your extra thirsty customers are looking for. This cup is made from a tough, clear plastic that will stand up to the task of holding all 32 oz. of a cold beverage. This cup will pleasantly display its contents as well. Great to commuting, features a tapered bottom section to conveniently fit most car cup holders. Being able to carry around a whole day’s worth of a favorite beverage has never been this easy with this great cup design! Decony cup is made of durable PET plastic Resistant to cracks and breakage, crystal-clear construction gives it an upscale look and feel that will give any beverage an eye-catching presentation. 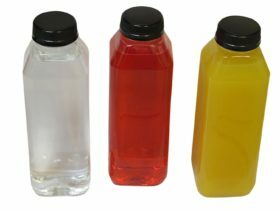 Empty Clear Plastic Juice Bottles Milk Bottles Food Grade BPA FREE with Black Tamper Evident caps 16 oz. 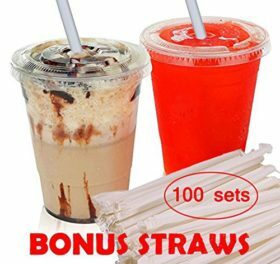 plus 10 ” straws – white labels – 8 sets – 8 juice bottles with lids -8 straws -8 white labels.